Although this season’s sickness may seem inevitable, I’ve got five awesome tips to keep you healthy all winter long. Fall and winter are my very favorite seasons, and there’s nothing worse than being stuck in bed when outside is fresh, cool, and crisp. This is the time for coffee, thick sweaters, candles, music, and family get-togethers. You don’t want to be sick when their’s such festivity in the air. 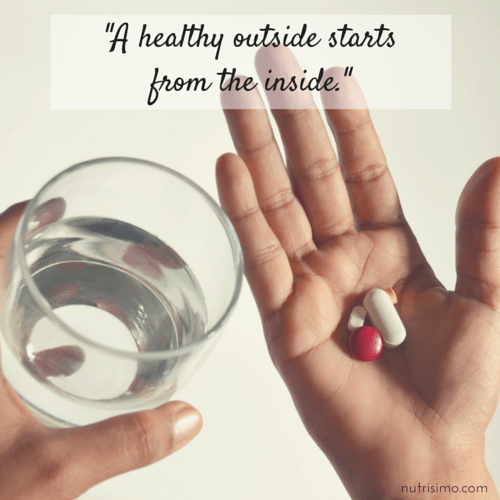 However, a weather change tends to weaken our immunity, so it’s extra important to be taking care of yourself. Here are 5 ways to stay well in winter. With the change in weather, and your body more susceptible to sickness, exercise is vital. Not only do you want to keep yourself in shape for the upcoming Thanksgiving and Christmas, but also for your immune system. Don’t use the weather as an excuse to skip your workout. You can always get in an awesome workout from home. YouTube videos or workouts DVDs are actually my favorite way to get my sweat on. So don’t exclude exercise from you daily routine. Exercising helps in strengthening the heart and lungs, and aids in spreading certain disease-fighting cells to diverse parts of the body – getting you ready for an immune system attack. You definitely do not want to over-workout, because that will hurt you more than help. Over-exercising wears down your body instead of building it up. Remember, all things in moderation. I know you want to enjoy the yummy treats that go so well with the season, but now is not the time to indulge. Sugar weakens your immunity and leaves you vulnerable to sickness. Eating a clean, balanced diet is probably one of the very best things you can do to keep sickness at bay. Going green in your diet does amazing things for your health. Clean eating is one of the best things to do for sickness prevention because the food you eat is literally the fuel for your body. If you don’t fill yourself with good stuff, you won’t get anything good out of it. Nourishing your body with fruits and vegetables is so important, since they contain essential nutrients that fight disease. Focus on eating lean, clean, and green, and you’ll feel great all winter. If you have no idea what eating clean is… check out The Eat-Clean Diet Recharged. It was the first book I read on the topic and is still one of my favorites. Yes, that means just what you think it means – drink more water. Water flushes toxins from your body and gives your systems a nice clean up. You should be drinking at least half your body weight in ounces. So if you weigh 150 pounds, you need to drink 75 ounces of water daily. Don’t just drink when you’re thirsty. If you’re thirsty then you’re already beginning to get dehydrated. Drink all the time. I’ve found that the best way to drink more often is to have a bottle of water always with you. It’s also easier to drink water if you add a squeeze of lemon for some flavor. You could also add cucumber slices for a refreshing taste. Using an infuser water bottle is a great way to stay hydrated. I love adding some zest to my water with fresh fruit. 5. Don’t Forget Your Daily Dose! Although taking vitamins is one of those obvious things that you should do to prevent sickness, I’ll still mention it because it’s important. However, some of us just hate (some of us actually can’t) swallow pills. If you are in this category, and even if you aren’t this still works amazingly well. You may just want to try using using this Heavenly Greens powder. Paired with the other tips I’ve already mentioned, you’ll have an edge over that oncoming wave of sickness that gets us every year. Going out of your way to take care of your body is not something that should only be done a few times a year. It’s a lifestyle that is possible for YOU! I know you can do it. Living a balanced life doesn’t mean dieting for the rest of your days. It’s about choosing the better option when the choice comes, finding contentment in your own skin, and overall just being happy with who you are. I hope the tips I’ve shared are helpful and you’ll remember these 5 ways to stay well in winter. Now tell me, how do you stay well in winter? Comment below with your best advice!